Want your Valentine’s Day wrapped in more love — and less waste? Wouldn’t it be nice if we all agreed to just pare down Valentine’s Day to its core? Why don’t we just view it as a sanctioned opportunity to tell those around us how much we love them? Check out our Simplify Valentine's Day resources—for friends/family, in the classroom, and in the community—to help you “reboot” Valentine’s Day into a day focused on kindness and generosity. At New Dream, we vote to reboot Valentine’s Day and to commit to a day of #morelovelesswaste! We all know that the best things in life aren’t things. In fact, studies that show that people are happier when they spend money on experiences instead of material objects. Below are five of our favorite ideas for expressing your love without “stuffocating” your loved ones. Download our free coupon book, and give your loved ones the gifts they really want. Give your mother a coupon for an afternoon volunteering with her at her favorite charity. Give your best friend a coupon for an evening off. Give your kids the gift of a late bedtime. Give your significant other a coupon for no dish duty or whatever chore he or she detests most. Get creative and make one coupon for each month of the year. So many ideas! For significant others, a fun gift idea would be to try to recreate your first date (unless it was a total disaster!). If you saw a movie, find the movie and plan a night in. Did you eat Mexican food? Look up the recipe online, and have a cooking date. If you’re married, pop in your wedding video and re-live the fun. For old friends, pull out a favorite movie or music mix from your childhood. Or find old letters and notes, and create a mini-scrapbook (or just bundle them up with a nice ribbon if you’re not the crafty type). For more creative and meaningful gift ideas, check out our More Fun Less Stuff Gift Catalog. Or, send us your favorite gift ideas at newdream@newdream.org. 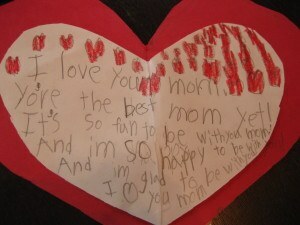 Children often participate in school Valentine parties by bringing in a card and treats for every child. But it doesn’t have to be this way. In her blog, Zero Waste Home, Bea Johnson describes how one of her son’s teachers created an “alternative exchange” for her students’ celebration. Each child was instructed to create one inventive, recycled, or edible valentine to be exchanged randomly. Each child brings in one large heart (ideally created from recycled materials—maybe even last year’s Valentines if you have them on hand). 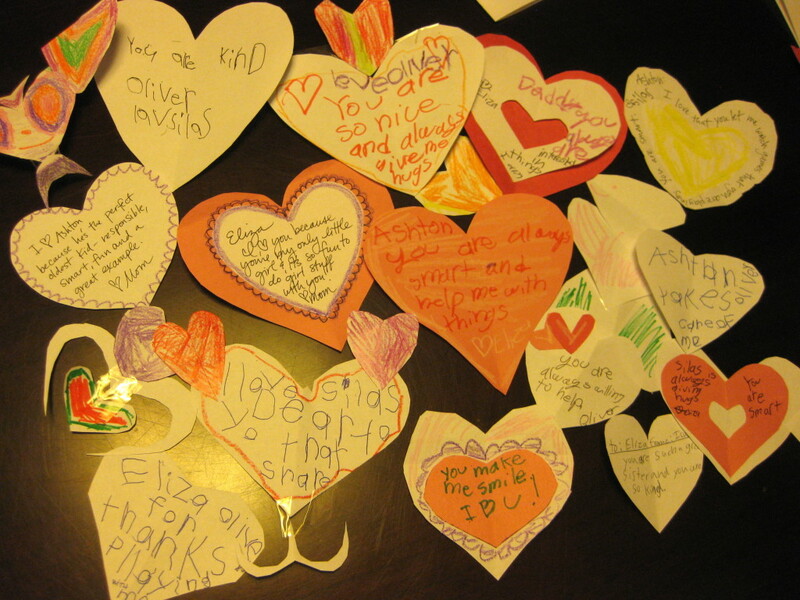 During the Valentine’s party, the hearts are passed around the classroom and each child writes a compliment to the heart’s owner. If the children are young, the teacher can write down the compliments. Alternatively, the children can each randomly choose one student before the party (a “Secret Cupid” of sorts) and write out the compliments on the heart and bring it to the party. You can hold a “generosity day” exchange where each student is randomly assigned a classmate and is asked to perform an act of kindness for him or her on Valentine’s Day. The class can brainstorm ideas beforehand, so they can be on the lookout for kindness opportunities. See “In Your Community” below for more generosity day ideas and our goal of 1 million acts of kindness! Depending on your school’s food restrictions, you can organize a cookie exchange. Each child brings in cookies to trade with his or her classmates and returns home with a container filled with a variety of cookies. Voila! Valentine’s Day dessert is taken care of. If you’re planning an alternative exchange this year, we would love to hear how it goes! Keep us posted at newdream@newdream.org. Over the last couple of years, the goal of Generosity Day has evolved into a simple one: instead of encouraging everyone to say “yes” to every request that day (although you’re welcome to try this! ), everyone is encouraged to commit to a simple act of kindness. 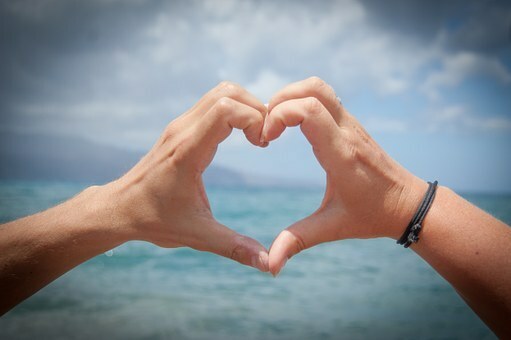 Our goal is to encourage 1 million acts of kindness this Valentine’s Day. For a terrific list of kindness ideas, see here. 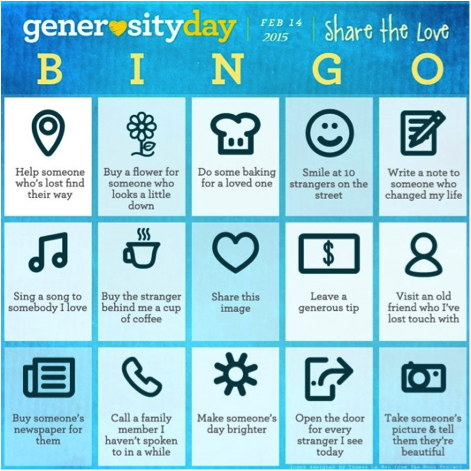 And, for an extra bit of fun, challenge your loved ones to a generosity bingo game (see "game board" to left). We would love to hear your personal generosity stories. Please feel free to share your stories with us at newdream@newdream.org.